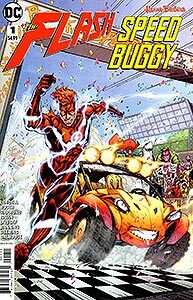 Brief Synopsis: Wally West and Speed Buggy fight Savitar and his new allies. Issue Notes: The issue credits list multiple inkers and colorists. However, only those who participated in the art for pages on which Booster Gold appears are credited above. PESL SIGHTING: Booster Gold doesn't appear until the epilogue of this story, but a familiar "PESL" is seen on one of the signs on this page. Booster Gold is among the many heroes of the DC and Hanna Barbera universes assembled to witness the race between Flash and Speed Buggy. (Proceeds will go to benefit charity!) Heroes in attendance include the Flash family (Barry Allen, Bar Torr, Jay Garrick, Linda Park, Wally West, and Wally West II), the Titans (Aqualad, Bumblebee, Donna Troy, Nightwing, and Omen), the Superman family (Krypto, Supergirl, Superman), Captain Atom, Firestorm, Hawkman, and Plastic Man. Most notable to Booster Gold fans is who Booster is paling around with: none other than Ted Kord! This is the first on-panel meeting between Booster Gold and the New 52 Ted Kord. As the race prepares to commence, Booster Gold and Ted Kord are joined in the stands by many other heroes. Identifiable characters include Anatole (of the Red Trinity), Atom, Batman, Birdman, Blue Falcon and Dynomutt, Captain Caveman, Chunk, Congorilla, Fluid-Man (of the Impossibles), Grape Ape, Hair Bear, Green Lantern Hal Jordan, Harley Quinn, Gloop and Igoo of the Herculoids, Jabberjaw, Mighty Mightor, Mister Miracle, Robin, Space Ghost, Squiddly Diddly, Superboy, Wonder Wheels, and Wonder Woman. Note that Booster Gold is cheering for Flash. Last time he watched Flash race, in Adventures of Superman #463, Booster also cheered for Flash. Everyone who's anyone has shown up to watch the Flash/Speed Buggy race! As Speed Buggy's daughter Debbie signals the start of the race, the sky has filled with the Green Lantern Corps (Guy Gardner, John Stewart, Mogo, and an Oan), Space Ghost's sidekicks (Blip, Jayce, and Jan), the Herculoids' Zok, Birdman's Avenger, Shazam, and the Spectre.